Manufactured to the OEM's specifications and requirements. 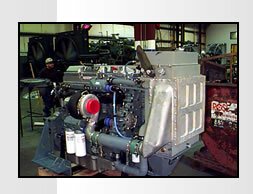 Complete industrial radiators offered to standard applications such as CATERPILLAR, CUMMINS, DETROIT DIESEL, WAUKESHA, and more. Manufactured to OEM's specifications and requirements. OIL and AIR coolers manufactured to replace defective coolers found on equipment and other applications. COOLERS available in All Aluminum, and special materials for use in CORROVSIVE ENVIRONMENTS and MARINE applications. Available to solve special cooling requirements. Our staff can design or work with your staff in developing new product or customizing product for specific requirements. We invite the challenge or helping with the small radiator used on FAN-TO-ENGINE applications, to the largest REMOTE RADIATORS equipped with FAN, ELECTRIC MOTOR and FRAME.